The 37-acre Lockman property provides a critical linkage of wildlife habitat and connectivity for the Ice Age Trail. You can access the trail via a parking lot on Paradise Road, approximately one mile west of I-45 in West Bend, WI. The terrain is rolling Kettle Moraine landscape. The trail heads north about 6.5 miles to CTH D, and winds north through Camp Silverbrook (owned by the Girl Scouts) along the heavily forested western side of Lucas Lake. It continues past an esker and crosses a marshy area with a bridge over Silver Creek. It goes up a steep ridge and re-enters land owned by CLCF, then continues north to Ridge Run County Park. What makes the parcel very special is that it connects 155 acres of habitat to the south with 524 acres to the north, for a total of 716 contiguous acres of protected lands for wildlife which has a national trail running through it. 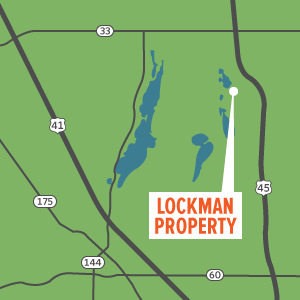 The Southeastern Wisconsin Regional Planning Commission (SEWRPC) classifies the entire Lockman property as containing high or medium quality wildlife habitat. The history of this parcel is a saga of land preservation versus development pressure. It is also a tribute to the tireless conservation efforts of CLCF amid uncertain politics. CLCF tried to purchase the land in 1996, but at the time the owner was not interested in selling. A developer secured the property under contract and tried to get permits to approve a variety of subdivision plans in 2005. At that time CLCF tendered a higher offer that was accepted by the seller but was in a secondary position. The drama for approvals continued to go back and forth between the developer, the Town of West Bend and the City of West Bend. After many municipal meetings an agreement was reached which resulted in a “Cooperative Boundary Plan” that gave policy support for conservancy lands between the two local governments. In 2006 CLCF purchased the property from the developer with “Angel” financing from West Bend Mutual. CLCF received partial reimbursement of the purchase funds in 2007, with a grant from the Knowles-Nelson Stewardship Program. Later the trail and parking area were developed for all to enjoy. Thank you West Bend Mutual!